iOS 8 App Development Essentials is the latest edition of this popular book series and has now been fully updated for the Swift programming language, the iOS 8 SDK and Xcode 6. Beginning with the basics, this book provides an outline of the steps necessary to set up an iOS development environment. An introduction to the architecture of iOS 8 and programming in Swift is provided, followed by an in-depth look at the design of iOS applications and user interfaces. More advanced topics such as file handling, database management, in-app purchases, graphics drawing and animation are also covered, as are touch screen handling, gesture recognition, multitasking, iAds integration, location management, local notifications, camera access and video and audio playback support. Other features are also covered including Auto Layout, Twitter and Facebook integration, App Store hosted in-app purchase content, collection views, Sprite Kit-based game development, local map search and user interface animation using UIKit dynamics. The key new features of the iOS 8 SDK and Xcode 6 are also covered, including Swift playgrounds, universal user interface design using size classes, app extensions, Interface Builder Live Views, embedded frameworks, CloudKit data storage and TouchID authentication. 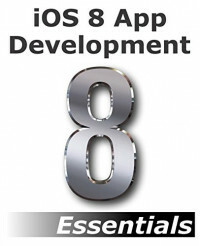 The aim of this book is to teach the range of skills necessary to build apps for iOS 8. iOS 8 App Development Essentials takes a modular approach to the subject of iOS 8 application development for both the iPhone and iPad, with each chapter covering a self contained topic area consisting of detailed explanations, examples and step-by-step tutorials. This makes the book both an easy to follow learning aid and an excellent reference resource.